If you're a parent, then at some point you've heard it said: It takes a village to raise a child. It's just a little ditty meant to soothe us parents who've realized that raising a baby is physically, mentally, and emotionally exhausting work and that sometimes we need to be rescued. For some, this rescuing may come in the form of a frantic midnight phone call to grandma the first time our child's temperature reaches the dreaded 100.4 degrees. For others, it may be dropping our little ones off at a friend/sibling/cousin's house just so we can have even an hour of desperately needed quiet, alone time. It even comes in the form of the unsolicited advice at the check-out line which at the time may seem like criticism but, upon further review, turns out to be the best parenting tip we've ever received. During these early months of uncertainty and sleep deprivation, when our self-confidence has been shaken down to our very core, we come to understand the true gravity of this message. It takes a village to raise a baby. This simply means that it's okay to ask for help. Parents are not infallible, and not only is it okay to ask for help, but it is expected that help will be needed. We don't come home from the hospital with our babies knowing what to do - - the learning has just begun. There will be times when we need to relinquish control and take a moment for our own mental sanity. Even for the stay-at-home moms who may not need child care on a daily basis, sometimes you need to let someone else take your child off your hands for a bit so you can simply run some errands in peace! It means allowing others to empathize and guide you. Without the village, we as parents are likely to find ourselves feeling completely alone. Where to turn for answers? Where to seek comfort when we realize we've made a mistake? Where to find support in learning to forgive ourselves these mistakes? These are all questions answered by this village! But, what about those parents who come home from the hospital and are without this "village" in the traditional sense? Not every parent is lucky enough to have a mother or a mother-in-law right down the road who is willing to help out on occasion. We don't all come from large families with siblings and cousins who are out there having babies as well. Plenty of us fly solo down the family route. And, of course, there are the many parents out there who are the sole caregiver to their little ones. It wasn't too long ago I found myself to be one of these village-less parents. My family lives in California, and I live in Florida. While my mother in-law may live only a few minutes away, she's in her eighties and not physically in a position to offer too much in the way of hands-on help. My parents were only children, so there are no cousins, and my only sister has sworn off ever becoming a mother in favor of her career. Additionally, not one of my pre-motherhood friends has joined me on the mommy track. When you're the only member of your group of friends to have a baby, you might as well resign yourself to the inevitable ex-communication from the group. True friends will wait it out with you as you become increasingly self-centered, single-minded, and flaky. These are the friends who know eventually the time will come when you've settled into your new role and will return to a sociable adult life. Unfortunately, though, most will think these changes are permanent and move on without looking back. I went at it alone for the first six months of my son's life. To tell the truth, I was finishing up my undergraduate degree when my son was born, so I still had excursions out of the house on a regular basis distracting me from my village-less existence. School provided that adult interaction so many new mothers come to crave in the early days, and our babysitter (a graduate student I paid out of my student loan money), supplied the care-giving support I lacked elsewhere. However, once classes were over, and I was at home alone with my baby five days a week, I suddenly realized how lonesome it is to be a parent without a village. Infants do not offer the greatest amount of interaction, and a person can run only so many errands during the day to keep occupied. It wasn't long before a delayed postpartum depression settled over me, and I became unglued. I felt on the constant verge of panic with my son who was experiencing chronic constipation due to nursing problems. Without anyone to turn to for help, the nursing problems continued, and the panic increased. Luckily for me, a fellow mother and splendid woman saw the distress in my eyes and pointed me in the direction of Amaya Papaya Play Lounge. By this time, I had made a few futile attempts to reach out and meet other moms. I'd looked into open gyms and "Mommy and Me" yoga classes, but there were always age limits or the price exceeded my budget limits. I'd met with mom groups through meetup.com, but nearly all the moms participating in those groups had toddlers and often met right smack dab in the middle of my little guy's morning or afternoon nap. When I heard about Amaya Papaya, it sounded perfect. It is a place opened by a fellow mother who had become dissatisfied with the same problems I had faced with play places and mom groups favoring activities and schedules of older children. 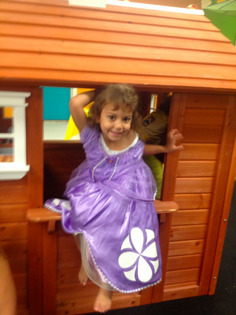 Though it took until her baby was three years old to open Amaya Papaya (named after her daughter Amaya), when her play lounge was finally open to the public, she remembered to include a special area specifically for babies ages 0 to 2! Still, I didn't run right out and visit AP. My son and I continued to circle the story time circuit for a while, but eventually on a day story time was cancelled we were looking for something to do, and I remembered the advice of the woman who told me about a play place with a space for babies. I finally decided to give it a try. Our first visit was at the beginning of the off-season, so it was fairly quiet. We went in the morning and were told our admission cost covered the entire day, something I never expected. I remember keeping to myself at first, just watching and listening that first morning, but we did return after my son's afternoon nap. The afternoons around Amaya Papaya are typically quiet and much more peaceful, very conducive to initiating conversations with fellow patrons. This is exactly what happened when we returned that first afternoon. I sat and discussed my nursing problems with a perfect stranger and immediately felt comforted by listening to her experiences which were unlike my own, but difficult for her nonetheless. Seeing her sitting there with her healthy and happy three year-old daughter, I knew our problem was not as worrisome as I had thought and, in the grand scheme of things, I knew that this, too, would pass. Driving home that day I noticed two things: I finally felt peaceful, and my son was so wiped out from all the play time he fell asleep in the car on the way home both times. After this, AP became a regular outing for us. We began visiting at least once a week, and suddenly life as a mom wasn't as lonely anymore. It does take a village to raise a child, if for no other reason than to remind us parents we are not alone. Since some of us do not begin our lives as parents with a built-in village, we need to reach out to find the necessary help and support. For those parents, I recommend coming to Amaya Papaya Play Lounge For their sake and their children’s, they should allow this wonderful community to become their village. 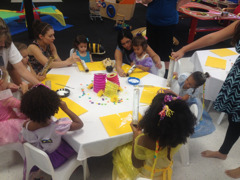 Classes, parties, and open play offer selections for a myriad of opportunities to meet other parents. Advice abounds in the play room, and there are always open ears to be found. Before you know it, you'll go from being the mom seeking the help to the mom offering reassurance to others in need. Oh, did I mention it’s good for your child's social lives as well? Amaya Papaya Play Lounge, where children play and parents learn. Rita Barnes is the mother to almost 2 year old Paul, frequesnt customer at Amaya Papaya and an Amaya Papaya Ambassador. When planning parties for little ones I often encounter parents that are at a loss as to where they should start or simply lack time to properly organize without becoming totally frazzled. My advice for parents is to do what makes party planning the least stressful and the most fun for your family, especially the birthday child. 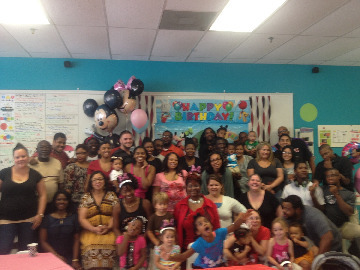 Since 2009 I have had the priveledge of helping countless families plan their child's birthday celebration. From the very simple play party to the most extravagant birthday blowout my staff and I have helped to create the "par-tay" magic! As my favorite shirt says: "I LOVE Parties and nothing makes me happier than to help a parent create a day that they or their child will not forget. Whether you are planning a birthday party at Amaya Papaya or another venue let me share my advice on planning the best celebration of your child's birth. Who are you planning to invite? Maybe you want to have a close family-only event, or maybe you want to invite 25 children (and their adults) to the party. If your child has a BFF, make sure you include them. Sending invitations out four to six weeks out usually ensures a good turnout to your party. What is your budget? Decide on a budget for your party. 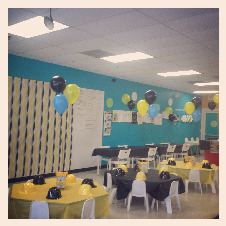 If you are looking to spend $100 or $1,000, you can create a memorable party for your little one. If you are looking at a venue to host your party, calculate the components of the party package within your budget. For example, at Amaya Papaya, half of our party packages include invitations, paper products and balloons, so you could deduct these items off your "to purchase" list. What are you going to do? Themed parties can be so much fun! If your child has a favorite character, movie, or television show, you can use this to determine the theme. Discover your creative side to develop a theme, or you can peruse sites, such as Pinterest, to give your creative side a kick-start! In addition to a theme, you might want to add entertainment. Balloon artists, face painters, bounce houses, characters and a DJ might be fun to add to a party. Make sure you contact your entertainment at least 6 weeks out from your event; they might require a deposit. Certain venues, like Amaya Papaya, are the entertainment. If your budget is tight, put your extra money toward your food and drink. Your guests will enjoy your party better. When will you start your party? One decision is weekday vs. weekend. On a weekend, more of your scheduled guests will be able to attend. For older children, a weekday party might be preferred; it stays clear of Saturday sports, rehearsals, etc. The time of day matters as well. If you plan to serve a meal, have your party during lunch or dinner times. If you are not planning to serve a meal, then plan your party between traditional meal times. Where do you want to hold your party? Home parties can be less expensive and you are not confided to time restraints. Venues, like Amaya Papaya, can be fun, exciting, and they make your job a lot easier, especially the cleanup. Local parks can be a fun place for a party. Make sure you contact the local Parks and Recreation Department to secure the location. When choosing to host your party at any venue, reserve your spot as early as possible to ensure you are able to get your desired time and location. Why are you hosting a party? Parties are supposed to be fun, so don’t forget the fun items such as: goodie bags for each guest, party games like a piñata or pin the tail on the donkey, and a fun music playlist that gets the party going. Throughout the entire process, don’t lose sight of the reason you are hosting a party: to celebrate the birth of your child with family and friends. Make sure you take plenty of pictures to remember to have fun! I hope this advice has been helpful and that it makes your party planning stress free. This year for my daughters birthday she opted on a destination party after having countless parties at Amaya Papaya over the years. My husband and I planned every activity yet left room for alterations in the schedule. It was a fabulous day for her and her guest. My husband and I left the party happy also. 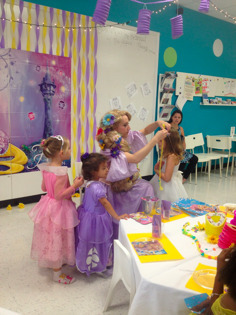 Yesterday at Amaya Papaya, I hosted our first "princess" tea party! 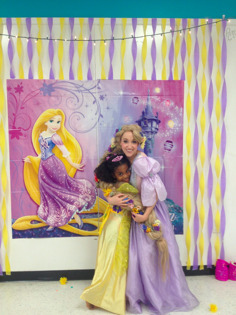 The special theme for this tea party was Rapunzel, and even featured a special visit from Rapunzel herself! 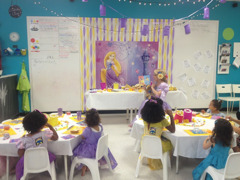 I have to say, that of all the tea parties we have hosted at Amaya Papaya, this was my favorite. 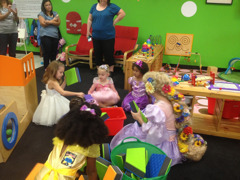 Amaya Papaya Kids Tea Parties are designed with toddlers and preschoolers in mind. We cater to the creative mind, short attention span, and desire for fantasy. While prepping for this party, I focused on the smallest guests that would arrive. I wanted to be sure that each guest could spend enough time exploring the lounge as well as enjoy the tea party specific activities planned. The morning started with our little guests' arrival, accompanied by their special adult, and dressed in their royal attire. 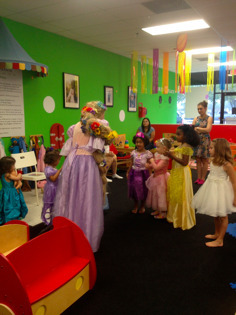 Each little princess was invited to explore the lounge before the first tea party activity began. 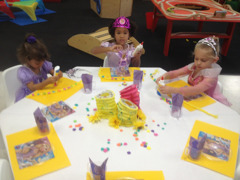 Our centerpiece decoration served as the craft supplies for the girls' first tea party activity! On each table, I scattered foam flowers around the "golden locks" I braided using yellow yarn. The girls were given glue to attach the foam flowers to the braids. I braided each braid using 9 pieces of yard cut 12 -15 inches long. The girls were then encouraged to go back onto the lounge to play while the glue dried and until the next activity. 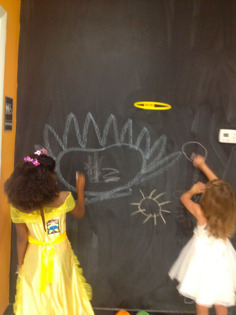 While the girls played, they were invited to come over to our chalk wall to draw pictures of "Rapunzel's sun". I think they did an awesome job! Almost looks like the Amaya Papaya sun! Rapunzel's arrival! Isn't her hair gorgeous! 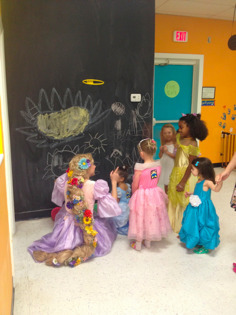 The girls were so excited to show Rapunzel the suns they made on the chalk wall. She was very impressed. From there, the girls took Rapunzel onto the floor to play where an unplanned activity was suggested by one of the girls: making a tower like Rapunzel's! 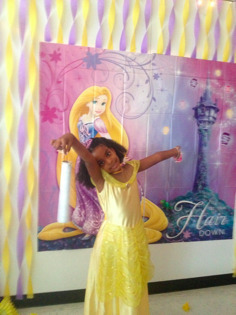 While they played...............the girls even showed Rapunzel the "hot dog" dance. 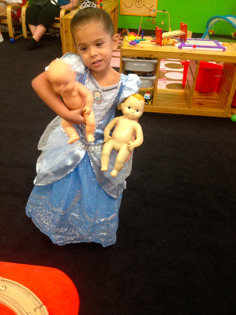 Once playtime was over, princess etiquette training began. You know......how to wave, curtsy, eat, and sit! Once the girls had the hang of etiquette, it was time to put it into practice at tea time! The girls feasted on a continental breakfast of bagels, yogurt, fruit, coffee cake, cereal, and "tea" of course. 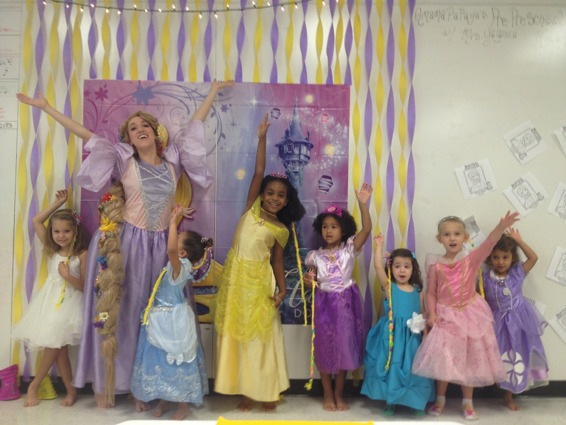 While the girls ate and enjoyed "tea," they listened to a story read by Rapunzel. 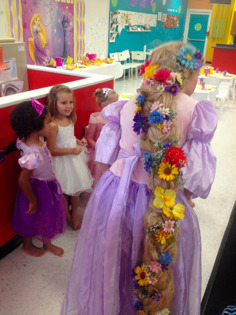 After tea time, Rapunzel attached the girls braid that they had previously glued the foam flowers to. After Rapunzel's departure, there was time for one last craft. The girls made paper lanterns using toilet paper rolls, white paint and string. Here was Amaya's finished project! It was indeed a great morning; just look at these faces! 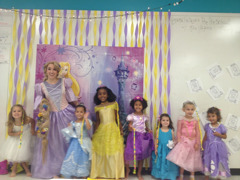 I can't wait until our next princess tea party! Anyone like Sophia? Halloween brings up nostalgic thoughts. As a kid growing up, Halloween meant a cool, if not cold night (I'm from Philadelphia), walking around your neighborhood with your family and friends going door-to-door, yelling “Trick or Treat!” I was lucky; my neighbors gave out great candy. Some of my elderly neighbors might even drop a few quarters in your bag! The culmination of the evening was my siblings and I dumping the contents of our bags on the dining room table, so we could swap favorites. So, in the spirit of Halloween, I am listing my Top-10 List of Halloween Candy. Potty training. Two little words that mean many things to parents. It could mean your little one is growing up. It could mean saving money on all those money-eating disposable diapers. For Mom, it could mean replacing a diaper bag with a change-of-clothes bag. For Dad, it could mean no more mall trips toting that lovely Disney Princesses Diaper Bag. It could mean breaking out in song; our drumming instructor, Mark, even has a song to sing that helps kids go potty! No matter what those words signify to you, they also mean consistency, effort and patience! When potty training your child, you have to be consistent with potty breaks. Have your little one sit on the potty chair with or without a diaper for several minutes each day. Don’t leave them alone; stay with them. Even if they sit there and don’t go, still praise them. We know how hard it is to have a 1 or 2 year old just sit still. My mom told me she set it up in the living room, in front of the TV to have me sit still, but that’s my mom! Be aware. When you notice your child is squirming, holding their private parts, or even squatting, get them to the potty fast! Become aware of the signs and help your child become aware of the signs, so they can begin to head to the toilet. After a couple of weeks of successful potty trips, it’s time to wear training pants (or underwear)! My advice is to have your child wearing bottoms that are easily removed. Don’t put them in those farmer overalls that you need a college degree to unhook. Not being successful because your equipment is not setup for success is frustrating. Soon, you won’t even remember when they wore diapers! Be careful with incentive rewards. If you choose to use a reward system, it should be based on the day’s efforts, not on singular events. I was listening to a Freakonomics podcast a while back and a father thought he could use an economic incentive strategy to help his daughter potty train. He decided that he could reward her with M&Ms for successful bathroom trips. But, little did he know that KIDS ARE SMART. She figured out she could go and “tinkle” every 30 seconds and get a reward for each “tinkle.” Kids 1 - Dads 0. It’s a tough job, but its one that parents like you have been succeeding at for thousands of years. Look at the bright side; just think of all the funny potty stories you’ll be able to embarrass your child with when they reach adulthood. I remember when...well, I’ll save that story until Amaya is 21! As we take time to reflect on the importance of Mothering, I would like to share with you my inspiration for the Amaya Papaya name and logo. AMAYA PAPAYA is a TERM OF ENDEARMENT FOR MY DEAREST DAUGHTER (and best business partner ever) Amaya. When I was pregnant with Amaya I dreaded the thought of getting STRETCH MARKS!! It was not until 2 days before I gave birth that the first stretch mark appeared, from that moment on they spread like wild fire! I was devastated (or so I thought, vain I know). Once Amaya was born my favorite song to sing to her was MY GIRL by the Temptations. The first line was so true..."I got SUNSHINE on a cloudy day".... Amaya was truly my SUNSHINE in the mist of anything that I was going through as a new mom. When Amaya began to speak she would ask me about the boo boo's on my belly. I would tell her that they where not boo boo's at all. I began telling her that the stretch marks where SUN RAYS that I was blessed with when she was inside my belly. As I began to think of a logo for Amaya Papaya, I thought that nothing would be more fitting than the SUNSHINE to represent Amaya and every other child that a parent has been blessed with. Thank you for taking the time to read my blog. This is always one of my favorite stories to post every year. I hope you enjoyed reading it! Peace and blessings. Sensory Play the Good Mess! Copyright 2018. Amaya Papaya L.L.C. All Rights Reserved.